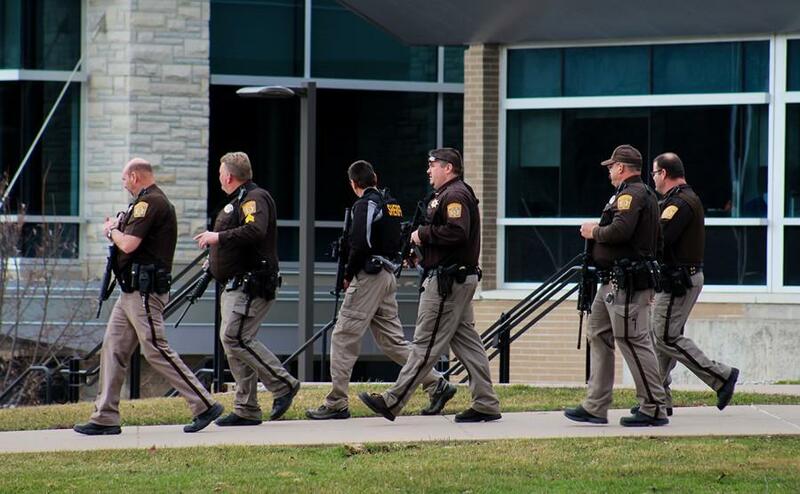 Grant County Sheriff’s Department patrol the University of Wisconsin-Platteville campus after reports of a firmarm in Ullsvik Hall. All buildings were evacuated after the 1:30 p.m. announcement. 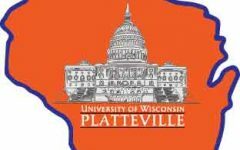 University of Wisconsin-Platteville Chancellor Dennis Shields closed all public campus buildings at 1:30 p.m. on March 14 due to a security threat in the men’s restroom on the first floor of Ullsvik Hall. UW-Platteville student David Kalenga-Kasongo was using the restroom when he heard a clicking noise that he interpreted as the racking of a gun. He pulled the Ullsvik fire alarm at 12:50 p.m. and called the Platteville city police. Kalenga-Kasongo later said he saw the barrel of a rifle that he thought was an AK-47. At 1:15 p.m. a Rave Alert, the emergency communication system UW-Platteville uses, informed people campus-wide to avoid the Ullsvik Hall area. “Go home, we’re clearing the campus,” Shields said as he passed students and faculty on the sidewalks between Ullsvik and the Markee Pioneer Student Center on his way to the Mining Room to discuss the decision with campus communication personnel and make the official call. Director of University Information and Communications and Public Information Officer Paul Erickson announced the closing over the campus public address system at 1:30 p.m., 40 minutes after the fire alarm went off in Ullsvik Hall. Fisher said she knew the alarm wasn’t a drill because the university does fire drills on Wednesdays and that faculty is informed if there will be one occurring. But not everyone knew it wasn’t a drill. The Hickory and Main coffee shop, where Buckhaus was working at the time, is located around the corner from the men’s restroom on the first floor of Ullsvik Hall. Sophomore industrial engineer major Joseph Lerdahl was walking to class when he noticed the groups of people crowding the sidewalks. 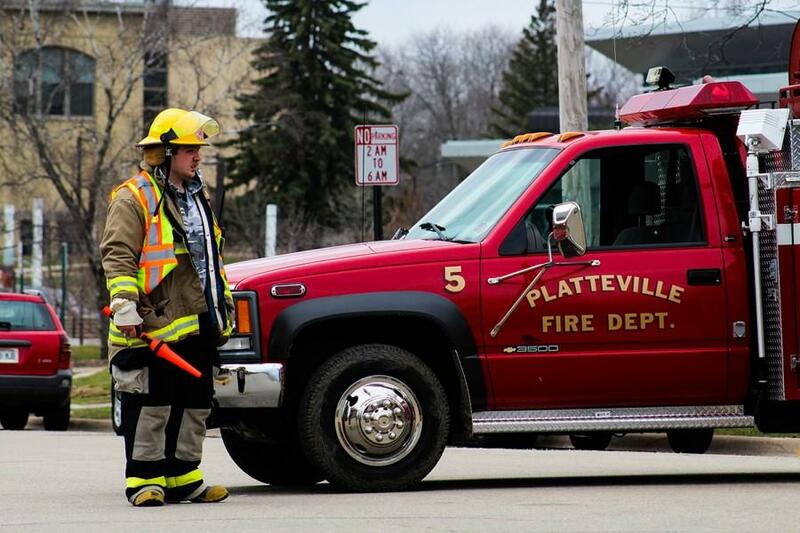 Platteville Fire Department directed traffic around Ullsvik Hall when several streets were blocked leading to campus. Lerdahl, who stood next to a reporter in the crowd, talked with other students about how long the drill was taking. 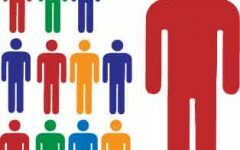 A group of faculty members behind Lerdahl wondered aloud what was happening. University volunteers in orange vests also seemed clueless. “It wasn’t until I saw police filing in with their rifles that I knew it wasn’t burnt popcorn anymore,” Fisher said. Across town, Platteville public schools went on external lockdown — no one was allowed to enter or leave buildings. The school day went on as usual and classes were dismissed at 3:20 p.m. as planned. “I’ve been here for 25 years and I’ve never known anything to happen at the university that put us on external lockdown,” a teacher from the public high school said. After the news conference, media studies major Betsy Heidt, who writes for the Exponent as part of a newswriting class, was walking through campus when she came across an unfired bullet outside of Karrmann Library. She called campus police, who sent an officer to collect the bullet. “There was a bullet found and we are in the process of determining whose it is,” Williams said. Williams said the bullet could have belonged to one of the officers. 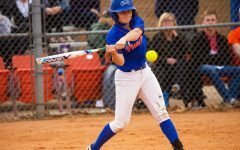 See Betsy Heidt’s article for her perspective. With additional reporting by Hannah Helwig and Mohammad Tazin.